With all the visits to the beach lately and all the talk of eating great seafood it is only fair to give you a little glimpse into my kitchen, too. My mom, my sister and I ate at Star Fish Dockside while visiting the Gulf Beaches and I mentioned here before that I like to buy my fresh seafood there at the market any time I can get by there. We've enjoyed many huge family dinners outdoors at the beach courtesy the marvelous fresh catches from Star Fish. There have been just as many smaller, more intimate dinners with just Mr. Meems and I at home. On this particular occasion we were blessed to have my sister with us. Seafood makes the simplest of meals outstanding. That opinion is probably because I LOVE seafood... well... ONLY if it is fresh. All photos in this post courtesy of my sister. She actually thought to take them ... thanks, Marmee. 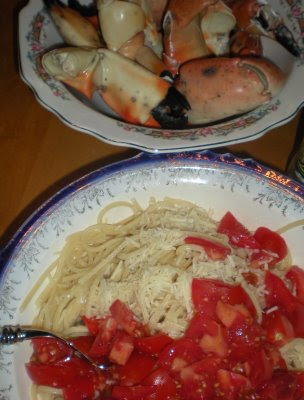 Stone crab legs are oh so, delish and oh so, easy to fix. They are in season until about May 15... so get somewhere and "get you some!" throw the crab legs in the boiling water and let them heat through. This only takes a minute or two. Walla! Serve with melted butter and/or whatever sauce you like. We like cocktail sauce with crab. I always peel, clean thoroughly, and butterfly each one no matter which way I decide to cook them. Sear a few cloves of garlic. With heat on approximatley med/hi to hi place each shrimp flat into pan. Watch for a little change of color from clear to solid. As they change color turn each one over and repeat watching for the color change. This is very fast. It only takes a few minutes all together. One of the tricks with cooking shrimp is not to over cook! The sides with our seafood included Barilla Spaghetti Rigatti noodles cooked 'al dente' tossed with olive oil and a little butter, shredded parmesan cheese mixed in and diced fresh Compari tomatoes topping. Some of us like to mix our shrimp and crab in with the pasta. Some of us eat it all separately. It's ALL GOOD however you choose to eat it. A freshly made side salad with all your favorite ingredients and fresh bread are always a sure compliment as well. I don't like seafood one bit, but that didn't seem to matter while reading your post - I was drooling at the deliciousness of your photos! It all looks SO YUMMY...wish I thought it also tasted that way! well, we missed the stone crabs, but we had fresh shrimp cocktail and fried grouper (from the Star Fish store)for our Valentine's Day dinner. MMMMM, good!! i served with baked potatoes, a side salad, and fresh strawberries from Plant City! it is so great living in the state of Florida, especially on our West Coast. we love it!! By all means keep the recipes for future use... I think you'll have to do some looking for fresh seafood in TN though. Which is the very reason my sister was hankering for some when she was here. One of these days... maybe you'll actually taste some you like... well, we did get you eating grouper much to our surprise right? At least you can get to some fresh seafood fairly easily down near the coast... if you really wanted to... it is available. OR you could just go to Angelo's and let them cook up some of their good seafood for you. mmmm-mmmm good. So glad you liked your grouper and shrimp. I almost always buy grouper there but with the stone crabs I knew it would be too much. Your fresh strawberries sound delish, too. all that food was so good. one of the best parts of my trip was being able to enjoy home cooked meals that are anything but ordinary. so delicious! No matter what it is ... if someone else cooks 'for us' somehow it just tastes better. It's pretty hard to mess up good seafood. So glad you were here to help us enjoy it.